This is another of my beloved ‘Terrier’ tanks. Locos like this were originally built to haul London commuter trains. 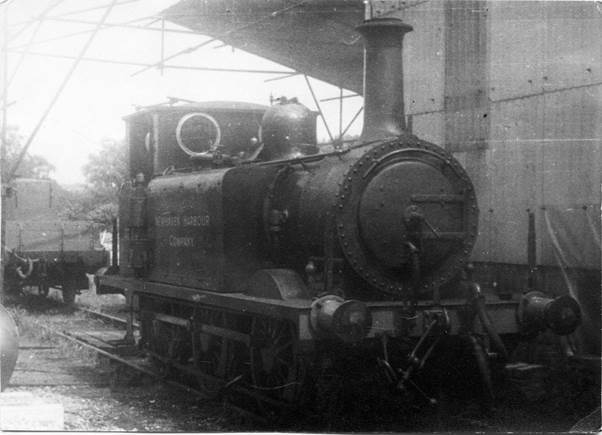 The first loco was delivered in 1872. This was one of the first and entered service in 1872. 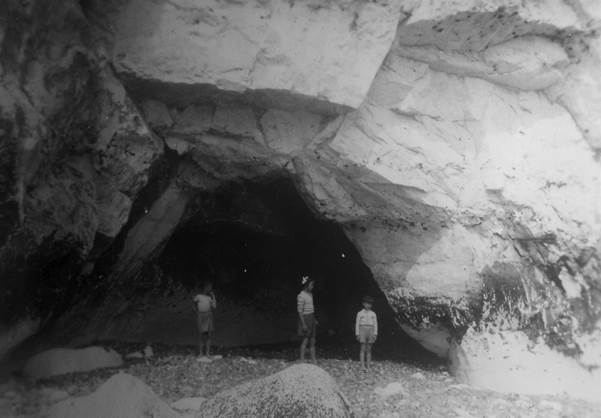 Like other members of the class it was named after a location in London and was called Fenchurch. The Terriers proved to be remarkably successful and soon they were not powerful enough for the loads they had to haul. They got spread around the little ‘empire’ that their company ran – the London, Brighton and South Coast Railway and also sold to other companies for further use. We have met them on the Isle of Wight and the Kent and East Sussex Light Railway. This one was acquired by the Newhaven Harbour Company in 1898. 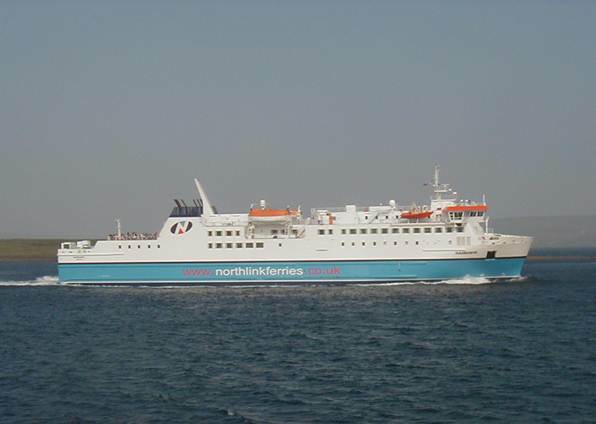 One of its main jobs was to haul fuel for the cross channel ferries to Dieppe. By some piece of weird management the fuel depot was on the west bank of the Ouse and fuel had to be taken to the ships on the east bank. The swing bridge carried the rails but could only carry light weight locos. A Terrier proved ideal. Now this photo is not mine. Despite many days spent in Newhaven I never saw a train on the bridge. I have sourced this one from http://freespace.virgin.net/jean.jean/TOC2Mus/Bridge2.html . We see a train, hauled by a different Terrier, crossing the bridge as recently as 1960. But back to good old Fenchurch. In 1926 the Newhaven Harbour Company was absorbed into the Southern Railway. The loco reverted to its old railway number and survived into nationalisation in 1948. I used to see the old Lady when I was a train spotter in the late 1950s and early 60s. By this time the loco was 90 years old – along with its twin they were the oldest engines still at work. The end came, as far as main line work was concerned when the old loco was withdrawn from service in 1964. The Bluebell Railway purchased her and there she still is. That’s where my photo (the top one) was taken, possibly in 1980 although it may have been earlier. Photos like this remind me of just how ancient I am. The scene is just off Newhaven. The year is 1954. I was five years old and so can remember scenes like this. Oh, I can also apologise for the rather poor quality photo. Let’s start with that sailing barge. It is just about to pass the end of the sea wall on the East sid eof Newhaven Harbour. I’d guess dad, who took the photo was on the much longer west pier. The barge, presumably, is running on a motor for the sail is furled. But it definitely looks like a Thames sailing barge to me. So yes, I remember these vessels in service. The other ship in the photo is a bucket dredger. This dredger was called the Foremost Prince and I believe she worked, clearing the mud out of Newhaven Harbour, from 1947 for about forty years. So back in 1954 she (or should that be he as he was a Prince) was quite new. The idea was simple. Bucket scoops on a continuous chain dredged the sea bed and then tipped the mud into the hold. When full, ‘The Prince’ went out into the English Channel and dumped its load. My dad always reckoned it washed back into the harbour. It certainly looks archaic now but yes, I remember it well. Watching the ferries going in and out of Newhaven harbour was always a popular activity. They were fun to watch from close quarters, where you could see the passengers and wave at them. They were fun to watch whilst sea swimming when you could enjoy the bigger waves which the ship created and they were fun to watch from the top of the downs, some four or so miles away. The fun there was to see the puff of exhaust from the ships hooter. It always sounded this before it entered the harbour area as a warning to small boats. Then you could wait maybe 25 seconds before you heard the noise. What a grand way of learning that sound really travels relatively (to light) slowly. From closer to we could enjoy the differences between ferries. My favourite was the Lisieux but Londres was quite good and it is Londres that my dad photographed back in 1954. 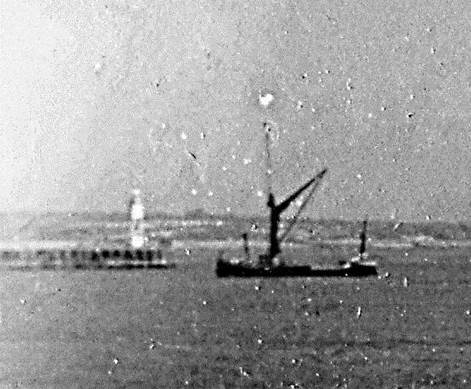 That’s Londres, leaving Newhaven just about 60 years ago. The thing that strikes me is how small the ferry looks. 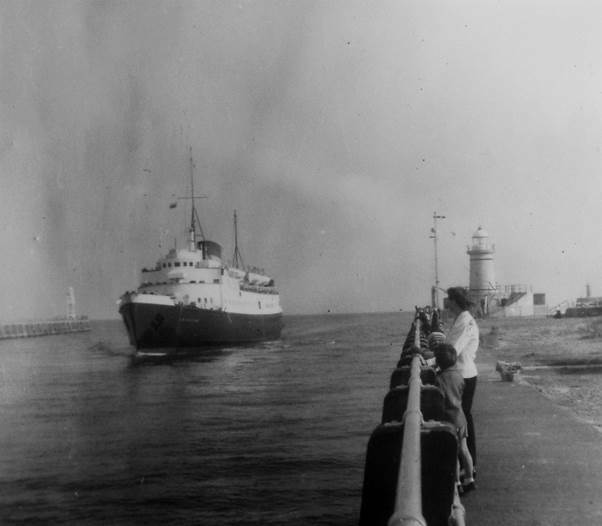 Back then there was no thought of roll on / roll off car ferries. These ships were for carrying passengers and many would have arrived on the boat train from London. These days ferries might have a kilometre of road on the car deck so no wonder they are much bigger than their older counterparts. And even if the passengers are small in the photo we can sense the excitement they felt as they headed off on what was still a real adventure. Passengers are crowded on the open decks waving at docksiders like us. I have once made the journey now. The fast ferry we booked on was cancelled and a slow one substituted. That one sailed happily to Dieppe where the tide was too high for it to dock so we gently cruised up and down outside the harbour for a couple of hours and then docked. There was none of the excitement or glamour of past times. But I was pleased to do it. During my early life ferries were something you watched. 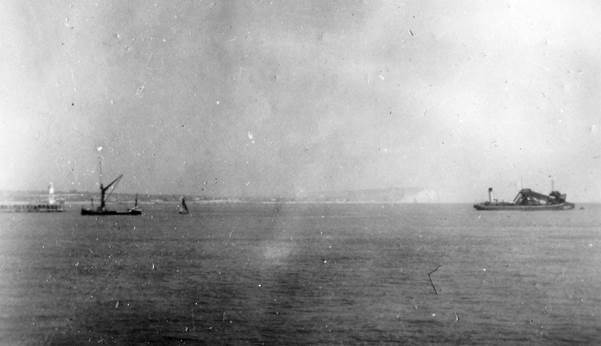 They departed from Newhaven in Sussex and vanished beyond the horizon. I knew the destination was Dieppe. It meant nothing to me. The ships mattered, or more to the point the names of them did – particularly if they were named after a French place. My favourite was the Lisieux. 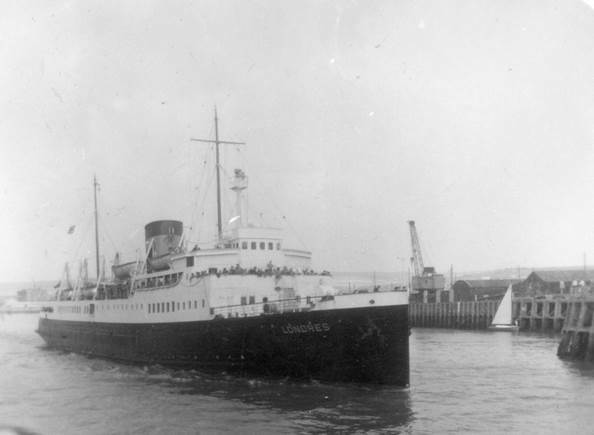 And there is Lisieux, leaving Newhaven in August 1954. That looks like my brother on the left. The open public decks on the vessel are crowded with waving people, saying farewell to England for a while. Lisieux was new then, for she had only entered service the year before. She operated the route until 1964 which meant she was there for most of my childhood. We often watched these ferries from some miles away on top of the South Downs near Firle. They always sounded a hooter before entering harbour and we’d watch out for the puff of steam from the hooter and then time how long it was until we heard it. ‘It’s a mile for every 5 seconds’, my dad told us. It was over 4 miles, so we counted up our seconds for quite some time. And now we’ll slip forward 50 years to 2004. 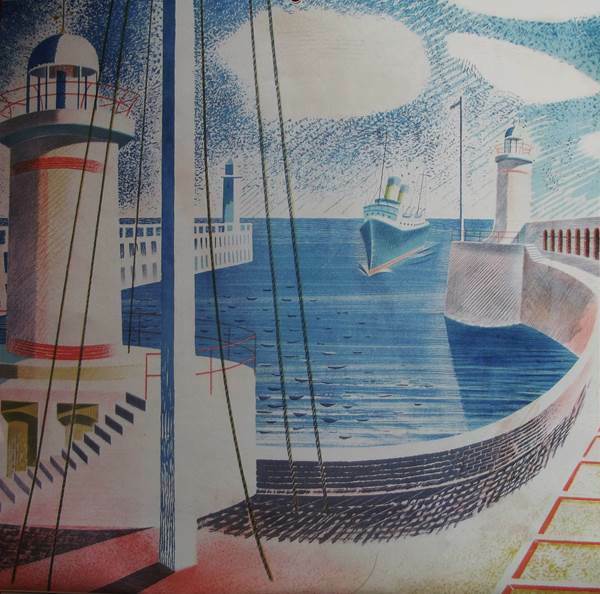 By now I was a fairly regular ferry user (but only once on the Newhaven to Dieppe route). I was still was happy to watch them. In 2004 my wife and I camped at Stromness on Orkney – a fabulous island group off the north coast of Scotland. 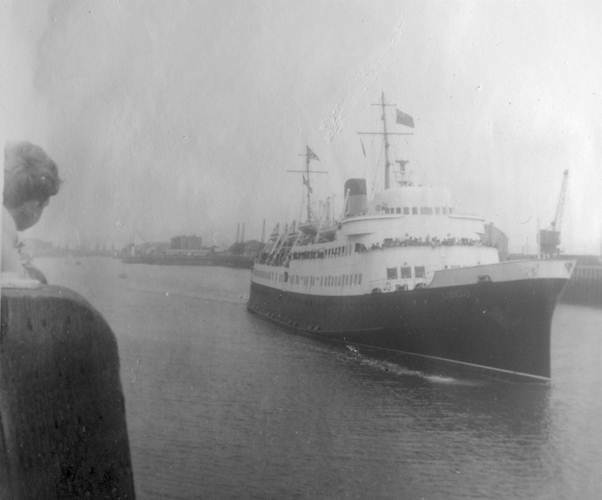 At that time the ferry was the Hamnavoe – or Hammy as we called it. It plied back and forth on the hour and a half crossing from Scrabster on the mainland to Stromness. On its final approach to the dock it can’t have been much more than 250 yards from our tent. She woke us on her night sailings but still we loved her. That’s Hamnavoe in Hamnavoe – the stretch of water by Stromness is what the ship is named after. There may be more from Scottish or further flung islands in the future. They seem to have been part of life for some time.